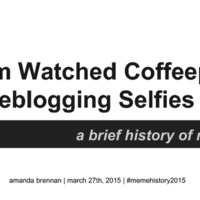 Amanda Brennan's presentation, "From Watched Coffeepots to Reblogging Selfies: A Brief History of Memes"
A presentation given by Amanda Brennan as part of the Bregman Digital Humanities Series, March 27, 2015. Amanda Brennan, “Amanda Brennan's presentation, "From Watched Coffeepots to Reblogging Selfies: A Brief History of Memes",” SUNY Potsdam College Archives & Special Collections Digital Collections, accessed April 21, 2019, http://omeka.potsdam.edu/items/show/35. © The State University of New York at Potsdam College Libraries, all rights reserved.